Banten Province holds a grandiose beach called Teraje. It is located in Sawarna Beach, Bayah District. That means it is situated near to other beautiful beaches, as well. So, what makes it unique? The most significant lure is the natural beauty. Not to mention there is unique view such as splashing waves on the coral reefs. These create a natural phenomenon, which is similar to a waterfall! Tourists also come to the beach for numerous activities such as photography and beach walking. So, are you going? It is a little bit difficult to describe Karang Teraje Beach. Though, you can learn from the name. Karang means “coral reefs” and Teraje means “stairs”. In a nutshell, it means the stairs of coral reefs! No wonder, most parts of the beach are covered by reefs. Some of them are quite big, in fact. They become natural borders, so the waves splash on them simultaneously. 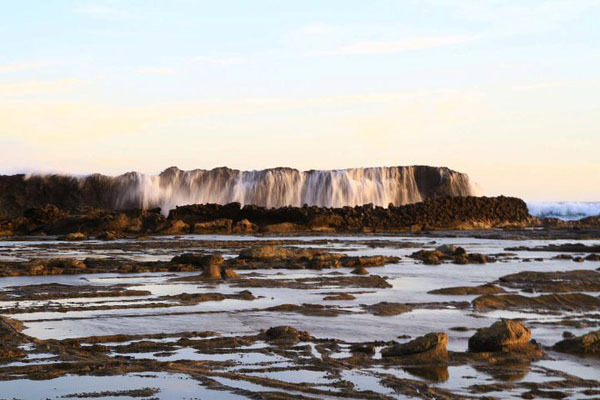 In terms of waves and beauty, it shares the same characteristics to neighboring beaches especially Sawarna Beach. The waves are strong and the landscape is beautiful. In terms of beauty, Karang Teraje Beach is indeed stunning. In fact, it is as beautiful as Sawarna Beach. Most of the visitors want to enjoy the sound of the waves and the stunning views of the beach. Also, there are majestic coral reefs. As the name implies, Karang means “coral reefs”. Many photographers come to the location for taking beautiful pictures. What’s next? Is it possible to swim in the water? Well, the waves are quite strong. It is not recommended to swim in it. The thing is you won’t find much sandy area. The beach is covered mostly by coral reefs. The splash of the water is also mesmerizing. Due to this reason, you can really enjoy the views and nuance in Karang Teraje Beach. It is a perfect location for relaxing and a family vacation. The coral reefs provide a shady and comforting environment. For photographers, you can take the best pictures from the top of the reefs. The thing is you must climb them first. Moreover, the slippery environment can be your main obstacle. Another interesting activity in Karang Teraje Beach is fishing. The locals take advantage of the beach to enjoy fishing. Some parts of the beach provide good fishes, as well. Somehow, it helps you to relax and spend times peacefully. Don’t forget to come with your family, though. It should be a wonderful family vacation for you! The beach is located in Sawarna Village. It is about 38 km from Malingping. If you come from Jakarta, you should head to Bayah District first. That means you must reach Lebak Regency and visit such district right away. It is going to be a long trip and the distance is roughly 182 km. In a normal traffic, you may spend approximately 6 hours. The best route is through Jagorawi Freeway! It is considered as the fastest.